Description. 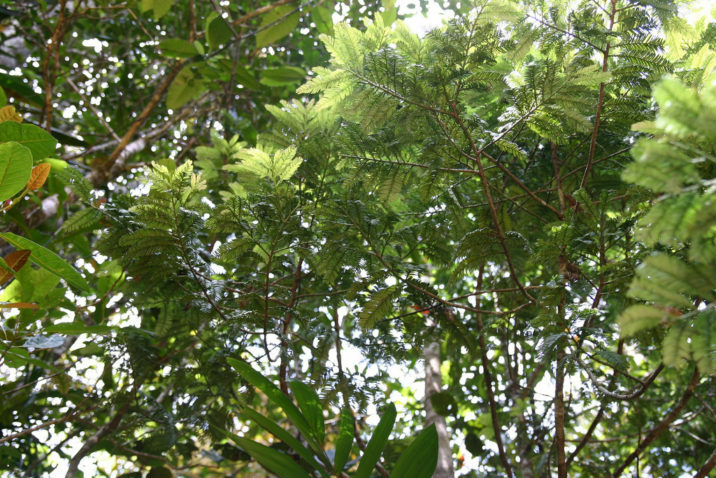 A. pancheri is an evergreen coniferous species of tree in the Podocarpaceae family which will grow to mature heights of 15 to 80 feet (5 – 25 m) tall with upright branches. Bark is hard, smooth, brownish and fibrous inside, becoming gray with age and scales brake off of old trees. Leaves are thick, scaly and variously formed on the elongated branches. They are linear-lanciolate on the shorter branches (similar to Taxus), sessile, 8-20 mm long, curved at the apex, green, with 2 indistinct stomatal bands above, 2 wide, bluish stomatal bands beneath and a green midrib. Pollen cones grow as yellow candles in clusters of 1 to 3 on terminal branches and are 1 to 1.2 inches (2.5 - 3 cm) long. 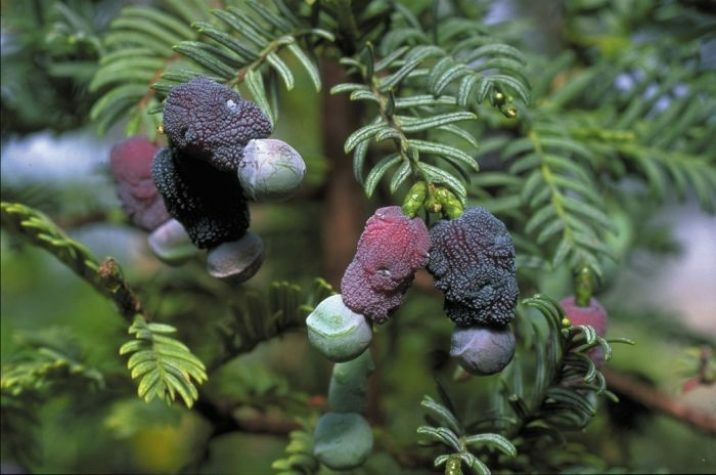 The bizarre purple, fleshy seed cones develop on a dense, scaly, long stalk on terminal branches. They have a fleshy, resinous, humped "foot" composed of several scale-leaves. Seeds are globular 0.4 to 0.44 inch (10 - 11 mm) in diameter without any fleshy part. They are thick and hard, and distinct with a rough surface and the side joining the epimatium. Distribution. This species is native only to New Caledonia — where it is common in the coniferous forests at the top of Mont Mou. Acmopyle pancheri at Royal Botanic Garden, Edinburgh, United Kingdom. Foliage and seed cone detail. Acmopyle pancheri growing in nature in New Caledonia.